Moongdal or split bean ladoo is my favourite sweet. But it became out of reach for my after I left India. The sweet was one of the big things that I really missed in my routines. By luck, I got a good friend Rajani Varma, Alkhobar who is also fond of sweets like me and also a very good cook of all karnataka specials. She cooks the sweets so easily as a part of her regular meals. And this recipe is a gift for me from her. This is a very easy recipe to try with immediately as you think. 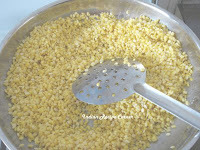 Take ghee in a deep saucepan and heat.Add moongdal and fry till more golden color on low heat. Stir continuously. Now grind moongdal with sugar in mixer nicely. It would be better if it is little bit coarse. Add cardomom powder and roasted nuts. Add hot ghee. Apply ghee in hand and shape the mixture in ladoos. 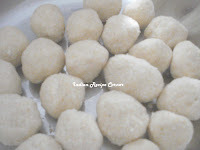 The same procedure can be followed to make ladoo in wheat flour instead of moongdal. Time required: hardly 20 mins. wow. nice site.. Innovative recipes & ideas.. thxs for visiting my site & ur comment..